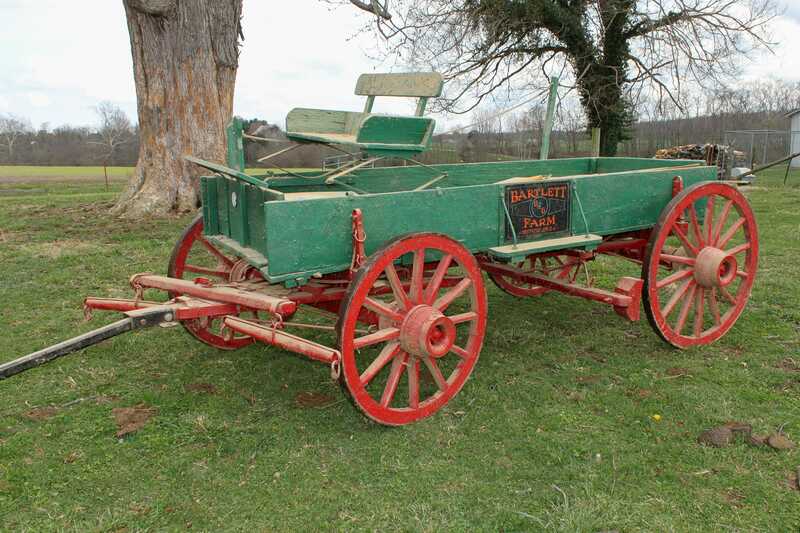 Bruce Bartlett Farm Auction — Harritt Group, Inc.
Mr. Bartlett has sold his farm which was founded in 1924 and will sell his contents live onsite including pickup truck, farm equipment, tools, country antiques & industrial items. Auction located just 1 1/2 miles NW of Martinsburg and 7 miles North of US Hwy. 150 off St. Rd. 335. 1989 Chevrolet 1500 pickup 350 V-8 long bed regular cab 96K miles. International Harvester 966 diesel tractor with Great Bend 660 front loader & extra front end weights with 4910 hours, International Harvester 544 gas hydrostat tractor with 7142 hours & Massey Ferguson 65 gasoline tractor with Kelly front loader with 8093 hours. NOTE All tractors are barn kept. 1800’s buckboard farm wagon restored in 2000. New Holland 488 haybine, Vermeer 605H round baler, Vermeer 360 hay tedder, Woods B72 Brush Bull, International Harvester 440 3-bottom plow, International Harvester 1300 sickle mower, Massey Ferguson 35 subsoiler, 3-point cultivator, hydraulic pull disc, pull & 3-point culti packer, harrow, subsoiler, Woods Cadet 72 rotary mower, International Harvester McCormick grain drill, rotary hole, New Idea manure spreader, (2) gravity wagons, (2) hay forks, pond scoop, hydraulic dump bed hay wagon, hay wagon w/sides, hay wagon w/steel bed, post hole auger, heavy duty 3-point hydraulic wood splitter, Hari 3-point sprayer, 2 small farm trailers, nice 5’x8’ stake side single axle utility trailer & more. Scag 15hp walk-behind mower, (2) Lawn Boy mowers, as-is 12hp Craftsman riding mower, (2) weedeaters, Stihl 028 AV chainsaw, Echo chainsaw, lawn roller, Cub Cadet push weedeater & Cub Cadet lawn cart. Craftsman radial arm saw, Craftsman drill press, new-in-box Porter cable compound miter saw, vises, tool chest & boxes, large selection of hand, power & yard tools, iron pipe rack, metal shelves, storage cabinets, tap & die sets, axes, nut & bolt bins, drill bits, acetylene set, house jack, selection of scrap iron, silo wood fencing, several rolling utility carts, galvanized feeder tank, (5) sheets of plywood, lumber, metal file cabinets, router tables, chains, workbenches plus more contents from garage & barns. New Holland Dairy ice cream clock, primitive single door cupboard, primitive blue painted 2-door cupboard, small oak cabinet, (2) retro lawn chairs, mission style rocker, wood top industrial table, metal lockers, metal shop desk/cabinet, (2) heavy steel rolling shelves, (4) metal industrial stools, warehouse cart, metal cabinets, New Holland milk crate, Purina Feed scale, wire egg basket, 1800’s skates, barn lantern, whirligigs, (3) sleds, True Valve wagon, wood tool caddies, berry handies, (2) blue painted wood tool chests, Pepsi case, sprinkling can, cast tea kettle, croquet set, wicker plant stand, folk art twig table, wood work table, Sinclair barrel, wood ladders, blowtorch, Wheeling galvanized washtubs & stand, barn lanterns, horse drawn plow, vintage white sewing machine, Coleman & Artic Boy drink coolers, wood boxes, old tins, horse collar, 200+ canning jars, vintage pressure canner/cooker, antique tools, concrete yard art & more. I-64 to Greenville Exit # 119. West 8 miles on Hwy. 150 to right on St. Rd. 335 to Martinsburg. 5.4 miles to left on Dutch Creek Road. 1 1/2 miles to auction on right. Plenty of parking.